The 30-Minute Vegan is a cookbook that includes over 175 easy-to prepare recipes that can be made in half an hour or less. The authors, Mark Reinfeld and Jennifer Murray, are a husband and wife chef team, who created this book for people with busy lifestyles who are craving more health and vitality. At the beginning of this quick and easy vegan cookbook the authors provides instructions in basic vegetarian cooking techniques such as using a chef’s knife, steaming, marinating, roasting, grilling, working with tofu and tempeh, juicing vegetables and cracking a coconut. Then they progress to the recipes including sections such as Smoothies and Satiating Beverages, Snacks, Pick Me Ups and Kids’ Favorites, Lunches, Extraordinary Salads, Sumptuous Soups, Small Plates, Wholesome Suppers, Guilt-Free Comfort Food, and Divine Desserts. In each section the recipes proceed from light with a high amount of raw food, to heavier or transitional foods for those who are new to a plant-based diet. They include a combination of more traditional items and comfort foods as well as unique and innovative recipes. The beverage section includes a selection of fresh juices, smoothies, nut-milks and teas including recipes such as Jolly Green Juice, Hazelnut-Fig Milk, Tropical Smoothie, and Almond Butter Smoothie. Choices for breakfast and brunch include Tempeh Bacon, Cosmic Crepes, Southwest Tofu Scramble, and Live Cinnamon Rolls. A variety of options for quick and easy lunches are provided such as Mediterranean Hummus Wrap, Live Nori Rolls, Japanese Soba Noodle Bowl, and a variety of salads and sandwiches. For dinner you can choose from lighter meals such as Raw Pasta Puttanesca and Sushi, or traditional comfort food like Cheesy Broccoli and Rosemary Garlic Mashed Potatoes. Desserts include Chocolate-Peanut Butter Shake, Coconut Macaroons, and Baked Apple Crisp. The book also includes a collection of menu ideas and special recipes for a variety of occasions including a hosting a dinner party, kid’s slumber party, summertime picnic, holiday feast and a raw food gathering. Fruit, vegetables, chick peas, lentils, black beans, tofu, tempeh, whole grain sourdough bread, brown rice, quinoa, soba noodles, brown rice pasta, avocado, almonds, walnuts, sunflower seeds, tahini, peanut butter, flaxseed oil, coconut, olives, sea vegetables, soymilk, tamari, miso, nutritional yeast, agave, maple syrup, raw cacao, carob, herbs and spices. 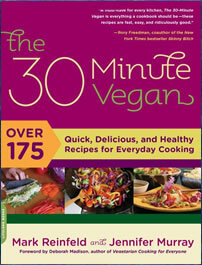 The 30-Minute Vegan: Over 175 Quick, Delicious, and Healthy Recipes for Everyday Cooking retails at $18.95. Click here to purchase this quick and easy vegan cookbook at a discounted price. All of the vegan recipes can be prepared in 30 minutes or less. Includes a combination of raw and cooked vegan recipes. Provides recipes that help dieters transition from eating animal products to a plant-based diet. Emphasizes the use of fresh, local and seasonal ingredients. A vegan diet has been associated with a reduced risk of developing conditions such as heart disease, cancer and diabetes. Will not appeal to dieters who don’t enjoy eating vegetarian food. Doesn’t include much information on the health benefits of a vegan diet. Some of the ingredients may be unfamiliar to those who are new to plant-based diets. Is not specifically created as a weight loss diet. May be necessary to supplement with vitamin B12 and vitamin D if eating a strict vegan diet. The 30-Minute Vegan offers a selection of quick and easy recipes suitable for both vegetarians who want to expand the variety in their diet, or omnivores that would like to increase their intake of animal-free meals. It will appeal to dieters with a busy lifestyle who appreciate healthy vegetarian food and love to cook.